Ginger- Make a wonderful cold weather tea with baby ginger leaf steeped in almost boiling water sweetened with honey. 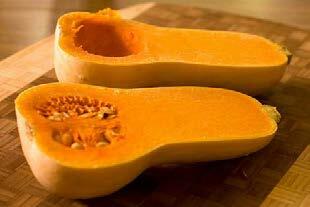 Winter Squash- Butternut squash this week! In the same family as pumpkin, is often times used in recipes in its place. So if you have recipes you like that call for pumpkin, try this as a substitute. My favorite “pumpkin pie” is made with butternut instead. Butternut squash lends itself delicious for both sweet and savory dishes. Used as an ingredient in homemade pasta, for stuffing, or cubed to be roasted, in soups, muffins and breads. If a savory soup or roast is on your mind, consider using Poultry herbs chopped finely in your dish. It is easy to cut in half, scoop out the seeds and roast in a bit of water for half an hour… then you can flip it over and dress with pumpkin spices, some fresh grated baby ginger, butter and brown sugar for a decadent treat. Or stuff with savory greens, herbs, cheese or rice blend and bake the halves for about ½ an hour at 400f. For a delicious pie, use 1 ½ cups of cooked/pureed squash, 1 cup of sugar/light brown sugar, 3 eggs, ¾ cup evaporated milk or half and half, dash each of cinnamon, nutmeg, ginger (insert some fresh grated baby ginger), salt, 2 tbs flour, 1 tbs of melted butter, 1 tsp vanilla combined and poured into a 9” pie crust, and if you like, garnish with pecans (i also like to add crushed pecans into the crust). Bake @350 for 45-50 minutes (or until the top of the pie is set) and allow to cool before cutting. Yum! Just a quick note on the baby ginger, since you are getting some every week: We wanted to suggest that if it is more than you can use fresh, store it in the freezer and just grate it into your teacup or recipe frozen, it will taste just like it is fresh! This entry was posted in CSA, CSADist, Cucumbers on October 8, 2016 by webmaster.